> Nestled just north of Downtown, this popular greenspace is a hit with both locals and visitors alike. 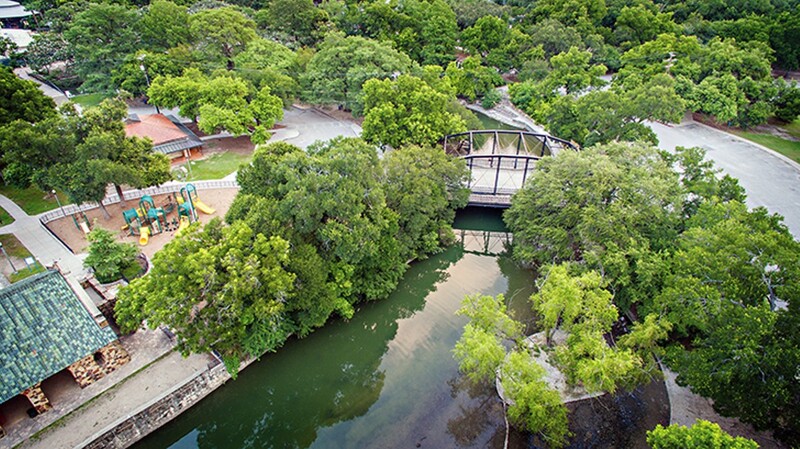 Within walking distance of the Japanese Tea Garden, the San Antonio Zoo, the Sunken Garden Theater and much more, the park features the life source of the city's most iconic feature aside from the Alamo: the San Antonio River. But you didn't just vote to say it's the city's best park, either. Brackenridge Park was also voted best playground for the second year in row. Maybe it has something to do with the Brackenridge Eagle miniature train? Maybe it's the multiple playscapes with all those fun slides, swings and climbing structures? Or, maybe it's the satisfaction of having a worn-out kid at the end of the day, isn't it? Whatever the reason, Brackenridge Park continues to be a San Anto favorite for outdoor fun in an urban atmosphere.